How were these free schools approved? The number of free schools hitting the rocks calls the DfE’s own processes into question. After a lengthy battle, involving the Information Commissioner, Laura McInerney has won her request for the DfE to open the application process to FOI scrutiny. Will the public now see why the DfE thought it a great idea to give public money the Discovery Free School – slammed by parents, Ofsted and the auditors? Will we be able to understand the DfE’s decision to hand millions over to the trustees of Al Madinah – now handed to another ‘trust’ without any parent consultation. And what about IES Breckland – part of a profit making schools group – where the principal has just resigned? Will we see evidence of Govian rigour in the approval process for Kings Science Academy – debated in Westminster Hall when David Ward MP (Liberal Democrat, East Bradford) joined Ian Mearns MP, Grahame Morris MP and Labour shadow schools minister Kevin Brennan MP to question minister Edward Timpson MP over the free schools debacle and alleged £6m corruption? The lack of local oversight in school place planning is a ticking time bomb. Schools in some parts of the country are bursting at the seams while elsewhere the DfE is funding empty places in free schools. One free school staffed only by ex soldiers has been approvedwww.phoenixfreeschool.org.uk in Oldham where there are already 1,100 empty secondary places. 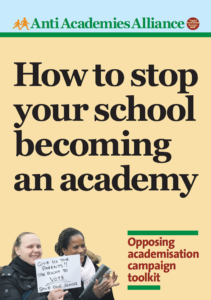 Over in Nottingham there are academy principals, caught up themselves in the gold rush to break up state education, opposing a free school on their own doorstep. 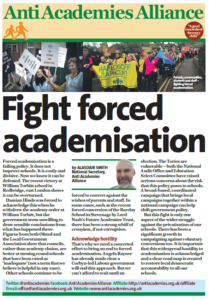 Please continue to support local campaigns against forced academies. Remember Snaresbrook school parents successfully saw off the DfE bully brokers with the backing of their council. In Bury, councillors are standing up and saying NO to the DfE and parents are fighting to save their community schools. Parents know that employing unqualified teachers and privatisation are not the solution to school improvement. Just look at Sandown Academy on the Isle of Wight (where Ofsted say 5 out of 6 secondaries require improvement or are inadequate and not one of them is a community school). In Lancashire, Fulwood Academy in Lancashire, sponsored by CarPhone Wharehouse magnate Sir Charles Dunstone now judged to require special measures. It’s obvious now even to Mr Gove that Whitehall cannot manage the chaos of 20,000 free schools and academies. He’s decided on a new middle tier. Not locally elected councillors but regional commissioners appointed by – guess who? – Gove himself and advised by a board of headteachers and academy principals In other words, headteachers will be held to account by other headteachers. But where is the accountability for parents and local communities? Meanwhile on 27 November at the Academies Show http://www.academiesshow.co.uk/ – the twice yearly jamboree for eduinvestors – Education minister, Lord Nash made a spectacular U-turn and announced that Ofsted is to inspect poorly performing chains. No wonder Nash has been conflicted; he and his wife run their own expanding chain in Pimlico, London – where principals seem to last about as long as wine gums. One mum there says parents are ready to walk out over the ED Hirsch-inspired knowledge curriculum – but there’s no parental choice for them because Lord Nash and his wife govern all three primaries in the area. 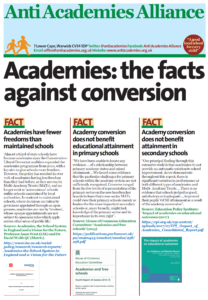 If you have news about other academies, chains or free schools please let us know atoffice@antiacademies.org.uk or tweet @antiacademies so we can build up our database. Finally, don’t forget that you have until 19 December to contribute evidence to the Education Select Committee inquiry on academies and free schools. This is a real and rare opportunity for the voices of teachers, support staff, trade unionists, parents and taxpayers to be heard in Westminster. This entry was posted in Blog, News, Top story and tagged Forced academisation, Free Schools, Gove, Legal, Parents, Primary, Rejecting Academy. Bookmark the permalink.